The Democratic Town Committee is opening its campaign headquarters this week and will hold an Open House on Saturday, September 25th, from 9 am to noon, at 35 South High Street offices. Coffee and refreshments will be served for all DTC members, friends, volunteers and candidates. Democrats may pick up lawn signs and sign up to help get out the vote. Following the Open House canvassers will be going out into city neighborhoods on behalf of the Democratic slate. The Tercyak 2010 Committee will hold “a night of Polish Fun” in support of the re-election of the 26th Assembly District legislator on Wednesday, September 29th. The event will be held from 5 to 8 p.m. at the Pulaski Democratic Club, 89 Grove Street, New Britain. There is a suggested contribution of $30 and a maximum individual contribution of $100 under the Citizens’ Election Program. 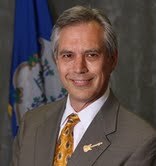 Rep. Tercyak was raised in New Britain from the age of two, graduating from the former Holy Cross Elementary School (John Paul II) and St. Thomas Aquinas High School. With degrees from the University of Connecticut (1980) and Capital Community College (1984), Tercyak is a health care professional, having become a registered nurse. Over his 25-year career, he has cared for thousands of patients with psychiatric and substance abuse problems. Tercyak continues his nursing career by providing home care nursing. The son of the late 26th State Rep. Tony Tercyak, Peter Tercyak was raised with a strong belief in the importance of activism and community service. He has worked on campaigns to reform managed care, provide job security and crack down on the rising cost of prescription drugs which are among his priorities as a lawmaker. Tercyak succeeded his father, a Republican, in the Legislature. He is seeking a 5th term. In the Legislature, Tercyak serves on the Appropriations, Public Health and Energy and Technology committees. The 2010 Freedom Fund Dinner of the New Britain branch of the National Association for the Advancement of Colored People (NAACP) will be held Saturday, September 25th at 6 p.m. The event will be held at CCSU’s Alumni Hall. Among the honorees are State Rep. Tim O’Brien and Rhona Cohen O’Brien. Tickets to the dinner are $65; $30 for children under 12. An annual membership to the 101-year-old civil rights organization is included in that admission. Contact the dinner committee at naacpnewbritainct@yahoo.com or call 860-827-8322. Ward 3 Alderwoman Shirley Black will be one of 11 women to receive a Leadership Award on Monday, September 27th at the 7th annual Ella Grasso Women’s Leadership Breakfast. The 7th Annual Ella Grasso Women’s Leadership Breakfast will be held from 8:00 a.m. until 9:30 a.m. at the Aqua Turf Club, 556 Mulberry Street, Plantsville. The keynote speaker is best-selling author, humorist and professor, Dr. Gina Barreca. Tickets are $50 pp payable to the Democratic State Central committee Federal Account. RSVPs are requested by Tuesday September 21st. Info 860-560-1775. This deliberate concentration of American’s wealth has made our economy undemocratic and top-heavy, and now the whole thing is toppling. As FDR said about the last great financial crash, “We have always known that heedless self-interest was bad morals; we know now that it is bad economics.” Or, to put it in the more colloquial terms of my Texas upbringing: Money is like manure — it only works if you spread it around. This entry was posted in Meeting/Event, Peter Tercyak, Weekend Update. Bookmark the permalink.